Yesterday, a day of despair. Hard to have any feeling of hope. At all. Darkness all around, people in pain, severe pain, and nothing I can do to alleviate the pain. Except to be there. And now and again, “to be there” makes me feel inadequate. Even though I know it’s a gift, not everyone get enough of. But it just seems too little, too ineffective, when pain is all around. Today. 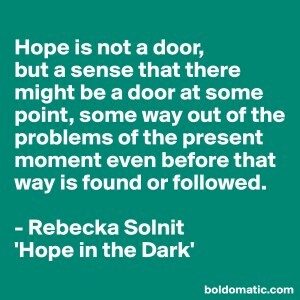 Upon aking up, I picked up my copy of Rebecka Solnit’s book Hope in the Dark, and met hope. Again. It seems to come and go. And that’s fine. All other human emotions do the same, so of course hope would too. And when I am in contact with my sense of hope, it is much easier for me to be present, to be compassionate and hold a space of love, for those around me in need. I don’t know where the door is, for this particular situation that grieves me so, but today, I am connected to the sense that we just might be able to find it. Somewhere. Somehow. And I am not alone. I am supported by family and friends, holding me – when I need it -, pushing me on – when I need that -, assisting me in reaching out to those who are in the know – and you bet that’s precisely what I need right now! So. Hope. Here again. I can see the darkness; the failings, the misery, the utter and total despondence. But I also see the light; the generosity, the outpouring of love and willingness to make an effort for a fellow human being. It’s not either or, total darkness or blazing light. It’s both. At the same time. All around us. And that’s hopeful!